Rescuers, however, continue to worry about flooding potential and oxygen depletion in the cave where a soccer team has been trapped since June 23. MAE SAI, Thailand — The adolescent soccer players trapped for two weeks in a partially flooded cave in northern Thailand don’t want their parents to worry. And they also wouldn’t mind having some fried chicken ready for when they get home. That’s what’s on the minds of the 12 boys, ages 11-16, according to handwritten notes they sent out with divers who made an 11-hour, back-and-forth journey to act as postmen. 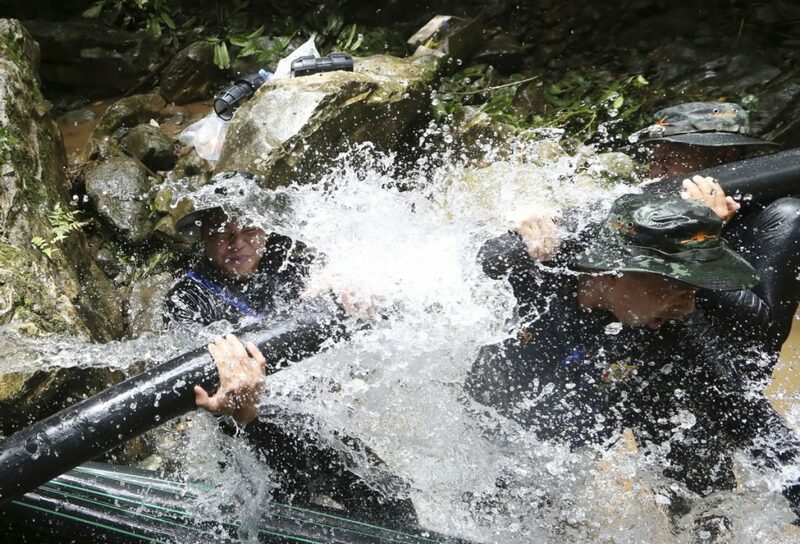 The boys and their 25-year-old coach have been trapped since June 23, when they went exploring in the Tham Luang Nang Non cave after a practice game. Monsoon flooding cut off their escape and prevented rescuers from finding them for almost 10 days. The only way to reach them is by navigating dark and tight passageways filled with muddy water and strong currents, as well as oxygen-depleted air. Thai officials are stressing that they may have to act very soon – meaning the next couple of days – if weather forecasts are correct because of the possibility that access to the cave could soon close again under flooding from seasonal monsoon rains. Earlier efforts to pump out water from the cave have been set back every time there has been a heavy downpour. Chiang Rai acting Gov. Narongsak Osatanakorn said that experts told him flooding from new rain could shrink the unflooded space where the boys are sheltering to just 108 square feet. The boys see their situation in less grandiose terms, according to their notes home, which were made public Saturday. In a letter of his own, the coach, Ekapol Chanthawong, apologized to the boys’ parents for the ordeal. “To the parents of all the kids, right now the kids are all fine, the crew are taking good care. I promise I will care for the kids as best as possible. I want to say thanks for all the support and I want to apologize to the parents,” he wrote.